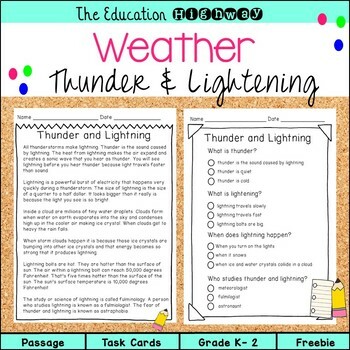 Weather unit for thunder and lightning.This is a sample freebie of a bigger unit. My goal for this unit was teaching about lightning and thunder. What to do when it thunders and you see lightning in terms of keeping safe. Learning about electricity in your home and how to be safe around it. Copyright (c) 2017 The Education Highway. All rights reserved by author.